Two of the movies being shown at this week’s GI Film Festival depict the contributions canines have made to the military, both as working soldiers and helping veterans deal with post-combat life. The festival, which is being held May 6-12 at various locations around the DC metro area, is a 501 c(3) non-profit educational organization that celebrates the successes and sacrifices of the service member through the medium of film. A Second Chance This 23-minute documentary short directed by David Aristizabal, tells the story of a combat medic who can’t adjust to civilian life following his honorable discharge and post traumatic stress diagnosis. After applying for a support dog, he looks to a rescued companion for a second chance at life. 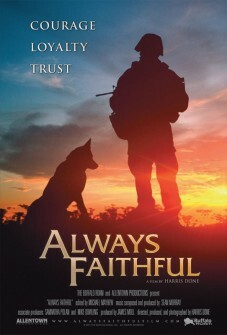 Always Faithful is a 70-minute documentary feature directed by Harris Done. This movie features U.S. Marine dog teams who perform the hazardous job of searching for IED’s and explosives in Iraq and Afghanistan. It follows five dog handlers from selection and training to deployment overseas, and explores the unique relationship and intense bond they share with their dogs. A ticket to see both movies is $12. Buy tickets online. The AMC Shirlington Theater is at 2772 S Randolph Street, Arlington, VA 22206.